Have you ever heard of the Finnish ghost called a Liekkio or Liekko? According to Peter Haining's Dictionary of Ghostlore, the Liekkio is the spirit of a child who was secretly buried in the woods. Often these children were the result of unwanted pregnancies, abuse and neglect, and even....murder. I can't help but think that Hansel and Gretel came pretty darn close to becoming a couple of Liekkios themselves! Liekkio means 'flaming one,' and that is exactly how these spirits are said to manifest. Much like the willow-o'-the wisp and the Jack o' Lantern, the Liekkio manifests as a dancing flame which lures travelers away to danger, and in some versions of the story, lures them to Tuonela, the Finnish realm of the dead. Seeing the Liekkio, whether you choose to follow it or not, is often regarded as a death omen, and the area in which they are seen is surely to be the spot of an upcoming death. 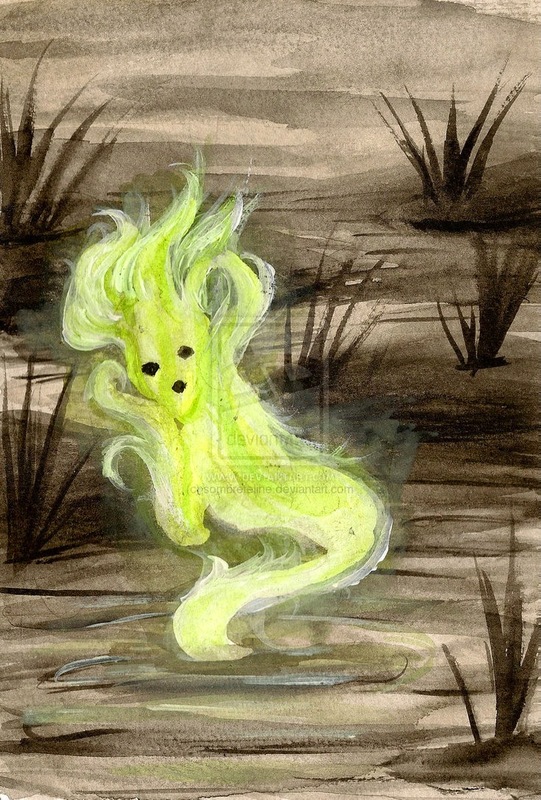 Today, the same explanation for willow-o-the-wisp (and the many other similar ghost lights seen throughout the world) is given for liekkios---swamp gas! Swamp gas is caused by the breaking down of organic matter in areas that are persistently wet. So the next time you're hiking through one of Finland's swampy forests and see a dancing flame luring you off your path, just ignore it and keep going! While it might not actually be a real GHOST, it might just lure you off into a dangerous area of the forest, filled with snakes, bugs, and other swamp-related hazards.